No Knives Ever Again. It's the Law. The FAA Reauthorization Act of 2018 (H.R. 302) included a provision that states knives are never again allowed on our planes. TSA can never again change policy. We ran an extraordinary campaign five years ago to beat back an attempt to allow knives on planes. We won in 90 days time with an extraordinary coalition and champions in Congress. Within 48 hours, then Representative Ed Markey led the charge in Congress and even after our win he kept up the fight with us then introducing legislation in the Senate when he became a Senator later that year. Senator Markey kept up the fight to ensure this language would be included in the FAA Reauthorization Act of 2018. The FAA Reauthorization Act of 2018 was signed into law on October 5, 2018, which included the No Knives on Planes provision as stated: "the [TSA] Administrator may not amend the interpretive rule described in subsection (a) to authorize any knife to be permitted in an airport sterile area or in the cabin of an aircraft." AFA has kept up the fight to permanently prohibit passengers from carrying knives into the aircraft cabin. We applauded Senator Ed Markey (D-MA), Representative David Joyce (R-OH), and Representative Dan Lipinski (D-IL) for taking the lead on the bicameral bill. 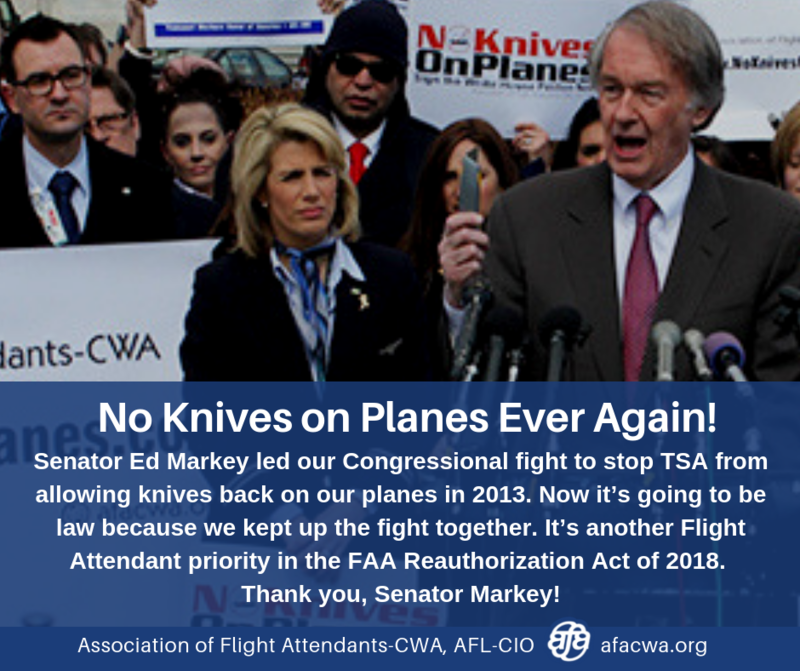 AFA led a coalition of Flight Attendants from across the industry to quickly mobilize after the TSA announced plans on March 5, 2013 to allow knives with blades up to 2.36 inches long back onto aircraft cabins for the first time since September 11, 2001. Knives in the hands of terrorists or mentally ill or drunk or drugged passengers would have posed a clear threat to everyone in the air and in airport secure areas. On May 6, 2013, AFA and other coalition unions representing Flight Attendants joined with TSA screeners, pilots, law enforcement officers and airline passengers to file a legal petition to the TSA against the rule change that would have permitted knives in the aircraft cabin. TSA Administrator John Pistole demonstrated leadership and sound judgment by responding to this petition and other stakeholder feedback. On June 5, 2013, the Administrator determined that knives will remain on the official “prohibited items list” governing what airline passengers may carry on their persons or in carry-on bags onto planes. AFA was quickly joined by other Flight Attendant unions and organizations representing virtually everyone else potentially affected by a new knife policy, including TSA security officers, pilots, gate agents, federal air marshals, and airline passengers. Flight Attendants thanked the American Federation of Government Employees representing TSA Security Officers, the Federal Law Enforcement Officers Association, FlyersRights.org, the nation’s largest organization representing air travelers, the Coalition of Pilots Associations, the United Airlines chapter of the Air Line Pilots Association, the families of Betty Ong, Sara Low and Alfred Marchand as well as Airlines for America, the trade association representing U.S. airlines for joining this fight.